JANUARY 2019 THE SHOP 7 is also a deceleration from the 5.0-percent surge of 2018. "There are several reasons for slower growth in 2019," says Hoyt. "The largest is that deficit-financed tax cuts at the start of 2018 lifted growth. No such support, in terms of an additional increase in after-tax income, is expected in 2019. Job growth will also be slower because of there being fewer available workers." Also, Hoyt notes that interest rates will likely be higher, a factor that can have a softening effect. SHELF PRICES RISE Retailers, for their part, are largely relieved of a problem prevalent in the marketplace a year back—the inability to raise shelf prices. "Lack of pricing power is still a concern, but is not as big of an issue now," says Hoyt. "Retail prices actually began to rise a bit in the first half of 2018, for the first time in three years. That's most likely because of the tight labor market and the resulting toleration for price increases by shoppers." 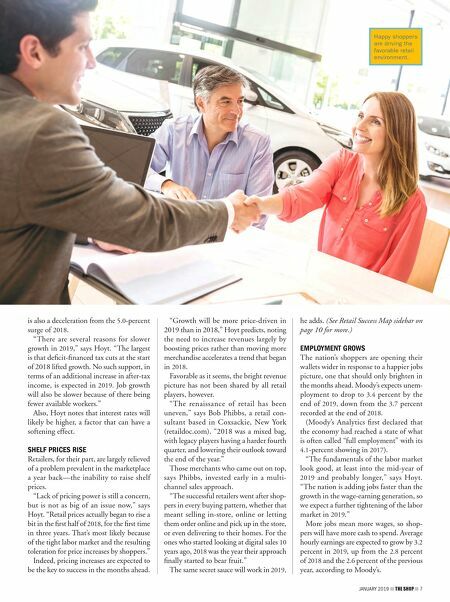 Indeed, pricing increases are expected to be the key to success in the months ahead. 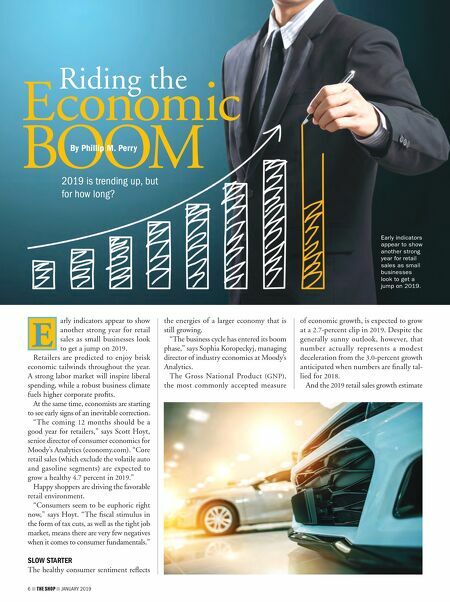 "Growth will be more price-driven in 2019 than in 2018," Hoyt predicts, noting the need to increase revenues largely by boosting prices rather than moving more merchandise accelerates a trend that began in 2018. Favorable as it seems, the bright revenue picture has not been shared by all retail players, however. "The renaissance of retail has been uneven," says Bob Phibbs, a retail con- sultant based in Coxsackie, New York (retaildoc.com). "2018 was a mixed bag, with legacy players having a harder fourth quarter, and lowering their outlook toward the end of the year." Those merchants who came out on top, says Phibbs, invested early in a multi- channel sales approach. "The successful retailers went after shop- pers in every buying pattern, whether that meant selling in-store, online or letting them order online and pick up in the store, or even delivering to their homes. For the ones who started looking at digital sales 10 years ago, 2018 was the year their approach finally started to bear fruit." The same secret sauce will work in 2019, he adds. (See Retail Success Map sidebar on page 10 for more.) EMPLOYMENT GROWS The nation's shoppers are opening their wallets wider in response to a happier jobs picture, one that should only brighten in the months ahead. Moody's expects unem- ployment to drop to 3.4 percent by the end of 2019, down from the 3.7 percent recorded at the end of 2018. (Moody's Analytics first declared that the economy had reached a state of what is often called "full employment" with its 4.1-percent showing in 2017). "The fundamentals of the labor market look good, at least into the mid-year of 2019 and probably longer," says Hoyt. "The nation is adding jobs faster than the growth in the wage-earning generation, so we expect a further tightening of the labor market in 2019." More jobs mean more wages, so shop- pers will have more cash to spend. Average hourly earnings are expected to grow by 3.2 percent in 2019, up from the 2.8 percent of 2018 and the 2.6 percent of the previous year, according to Moody's. Happy shoppers are driving the favorable retail environment.